Compo lifeguard Hannah Mello of Westport played the part of a drowning victim in a recent rescue drill at the beach. They’re as much a fixture at Westport’s beaches as sun, surf, sand and seagulls, but without these skilled swimmers, summertime fun would be a lot less safe. The shoreline’s lifeguards, who keep watch over Compo and Burying Hill beaches, will soon hang up their towels for another season. But the guards say the summer of 2015 has been a fun, engaging and worthwhile time, with friendships forged and vital assistance given to a grateful public. 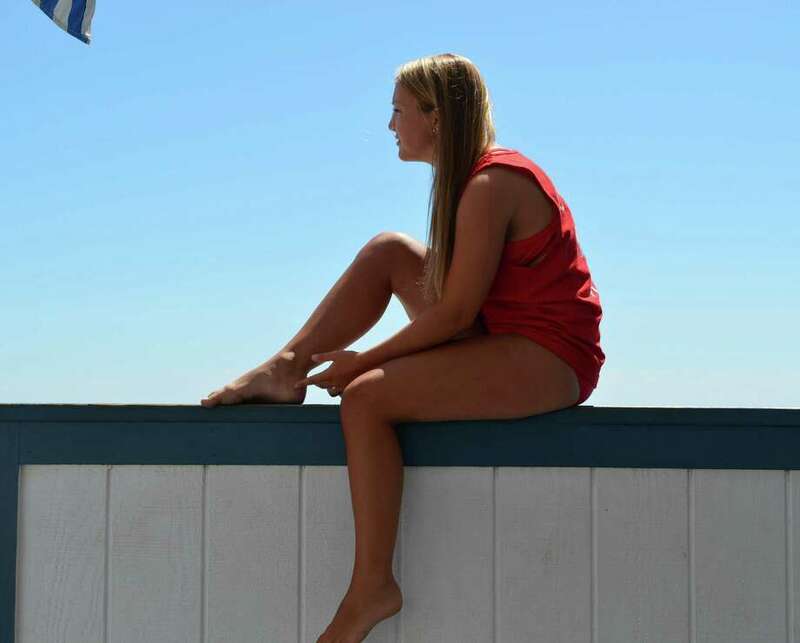 Last month, 16-year-old Callie Collins helped save a young woman’s life at Burying Hill Beach. A fisherman along the inlet saw the woman, who appeared to be trying to swim over from Sherwood Island and was struggling out beyond the designated swimming area. The fisherman notified Collins of the emergency. “I swam out and my partner took the board,” she said. They were able to bring the woman safely back to land. Throughout each summer — and as the season winds down — training remains a top priority for the lifeguards, 12 of whom are on duty at Compo at any one time. Each week, a drill is conducted at Compo in which a mock rescue is performed. “We’re a very preventative lifeguard service,” said Alex Mirabile, assistant waterfront director, who said the lifeguards are trained as medical first-responders as well. In last week’s training exercise, it was lifeguard Hannah Mello’s turn to play the role of a swimmer who ventures too far from shore and needs to be rescued. Mello entered the water far down the beach and swam across to the center of the east beach at high tide, far from shore. Contrary to what many Compo visitors believe, the line of buoys some 100 yards off shore is not the limit for swimmers, but to warn boaters to stay on the other side. Lifeguards said people are required to maintain distance on the shore side of the buoys for their own safety, and a large part of their job includes alerting swimmers from going out too far. Once the drill was underway, two lifeguards sped out on surfboards to reach Mello. As they brought her in, three others then swam out to meet them and help bring her into shore. Once back on shore, the lifeguards ran through a series of resuscitation drills on a CPR dummy, while supervisors observed their method. “It’s a weekly training exercise, but no guard sees it coming,” said Kaitlyn Mello, waterfront director and 10-year veteran of the lifeguards. Like most others involved with the group, Siecienski, a college senior working at Compo for his fifth season, has found camaraderie among fellow lifeguards. “We try to get together in the winter at least once,” he said, noting that the waterfront crew pulls together by sharing time and a common goal. “It’s a pretty close family,” said Kaitlyn Mello, a full-time science teacher in the off-season. But the summer season is drawing to a close, lifeguards are no longer on duty at Burying Hill. Compo will have lifeguards through Sunday, but from the following day to Sept. 4 there will be no coverage. However, some lifeguards will be on duty at Compo for the Labor Day holiday week, Sept. 5-7. Next year, new faces are expected to join the lifeguard ranks, along with veterans who enjoy the experience.